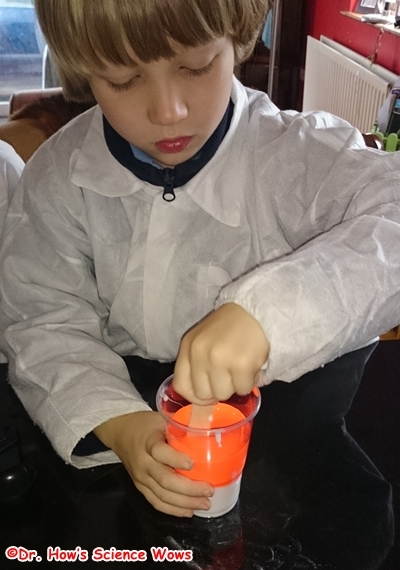 With a name like “Glowing Monster Slime” you just know this experiment is going to be fun! Just look at the photos if you need any convincing! To the first cup add half a cup of fluorescent paint and half a cup of PVA glue and mix well. In the other cup add half a teaspoon of borax powder to one cup of water and mix well until all the powder is dissolved! 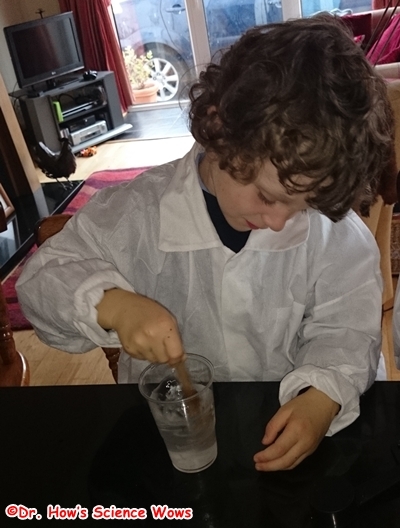 Now for the fun bit… pour the glue mixture into the bowl then add the borax solution, mixing all the time. After a while you can use your hands to mix and mould until you have one big lump of slime and there is little, or no liquid left! You can store your slime in a ziplock bag or clean jar, it lasts a very long time once you do not let it dry out. You may notice a small layer of liquid separating off the top of the stored slime. This can just be poured off and the slime will become a little more rubbery and less sticky. 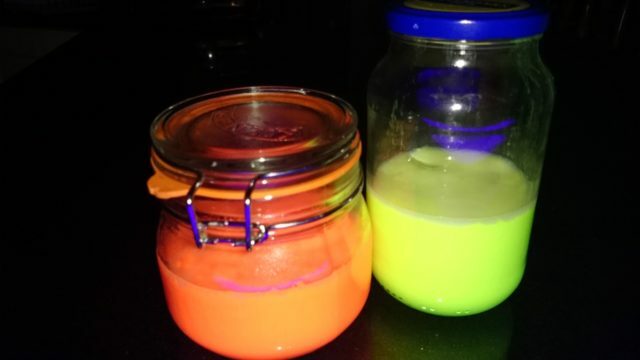 If you have a UV light (black light)** you can make this experiment even more fun by checking out how your slime glows in the dark once the lights go out and the UV light is turned on. Congratulation… you have just experimented with polymers!! In simple terms a polymer is a substance made up of lots of molecules arranged in long chains. If you imagine that the glue is like cooked spaghetti, it slides and slips around the place quite easily. When we add the borax to the glue it causes some of the molecules in the glue to stick together making the glue more rubbery and less liquid! Imagine if you took those strands of spaghetti and tied them together in places, the strands would not be able to slip and slide around nearly as much! The borax and glue mixture is just like your knotted spaghetti! *Where can I get Borax powder? In Ireland you need to buy Borax powder in a pharmacy. The production is a little erratic and the larger volumes are no longer available! You should be able to get a 100g tub in any pharmacy and it costs between €2 and €3. **Where can I get a UV light? This experiment is lots of fun without the UV light but the glow in the dark bit really does take it to a different level. My youngest nearly burst waiting for the night to fall so we could do that part of the experiment. If you are considering buying a UV light you should be able to get one fairly cheaply. I got mine from Maplin. 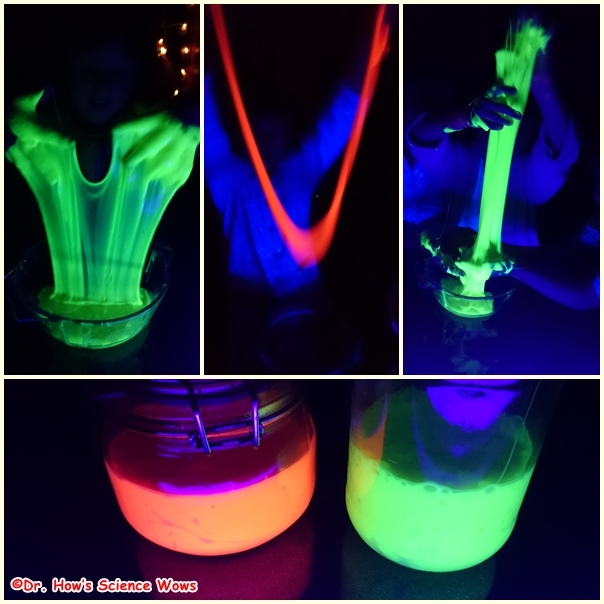 I will be sharing lots more glow in the dark experiments, so if you do get one remember to check back here for some more ideas. I hope you enjoy this as much as we did and please let us know if you do try it out! UPDATE 2017: Borax powder is no longer as readily available in Ireland. 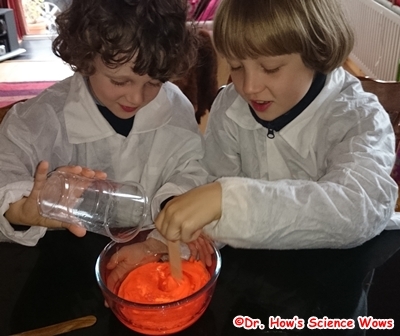 here is one alternative, using very simple ingredients… check out this post on how to make silly putty. 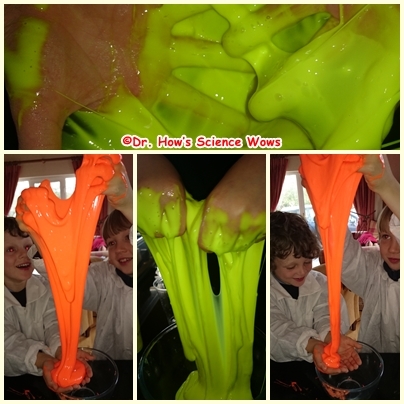 Or check out our Ultimate Slime Guide for lots of fantastic slime recipes using contact lens solution or laundry detergent.